For something that is supposed to keep track of 4 billion years of history, the geologic time scale is quite a fuzzy and slippery yardstick. After two centuries of careful research and argumentation, the world's geologists have only recently adopted a system to literally nail down the different time periods taught in geology school. 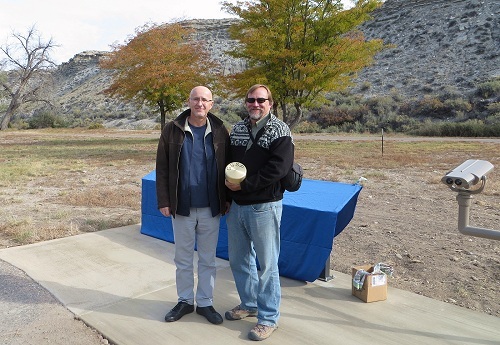 Last week that project took another slow step forward as a "golden spike" was officially driven into a precise spot on the ground near Pueblo, Colorado, a benchmark for the beginning of the Turonian Age. The public knows a few things about the geologic past. They know that "the Jurassic" is part of the time of the dinosaurs, for instance. That's a good starting point. The Jurassic Period began with Alexander von Humboldt in 1795, who recognized that the set of rocks neatly displayed in the Jura Mountains (between the Rhine and Rhone rivers) had their own distinctive set of fossils. Later on, workers took the Jura as a template for a particular period of ancient time that could be assigned a place in line, along with the Cambrian, Silurian and so forth in a chain of time units. There was always the promise that this work would add up to something definitive and seamless. Putting all the world's rocks in order is a task almost beyond metaphor. Students are told that deciphering the geologic record is like reassembling a book whose pages have been torn apart, crumpled, burned and scattered. It's worse than that: it's like assembling a dozen giant jigsaw puzzles from crumpled, burned pieces that have been mixed in a pile after throwing away half of them, including their original boxes with the pictures on top. Geologists have done that job, most of it. The first geologic time units were based purely on oceanic fossils, which was fine as far as it went, but other rocks have fossils of land-dwellers and most rocks don't have any fossils at all. Lava and granite and the rest of the igneous rocks were mostly left out until precise chemical methods based on isotopes were slowly perfected in the 20th century. With other rocks, their magnetic fields are the only information that can be used for dating. With still others, the only tool in the kit is dumb basic stratigraphy—the geometry of what rocks lie above and what below. Think of each of these sets of rocks as one of those jigsaw puzzles. By a few decades ago, the rocks dated by all these different methods were well enough assembled that it paid to coordinate their stories more carefully, starting with the time scale itself. That's when the International Commission on Stratigraphy set up the system of Global Stratotype Sections and Points, or GSSPs. These are actual places where the exact boundary of a particular time unit is set down in stone, just as bronze benchmarks are cemented in various places for land surveying. The sites for the GSSPs have to be carefully chosen, of course. The rocks must be well preserved and well exposed, with no gaps in time. They should display the specific fossils that define the pertinent time units. Ideally they should have a few layers of volcanic ash for producing isotopic dates to supplement the fossils. They need to be owned by the right sort of people who won't bulldoze them out of existence. And they need to be easy for experts from around the world to visit and sample. This is the site that the experts found for the Turonian Age. There are approximately a hundred small-scale geologic time units, called ages, that make up the larger units like the Jurassic Period (which contains 11 ages arranged in 3 epochs). The Turonian Age is one of the parts of the Late Cretaceous Epoch, which in turn is part of the Cretaceous Period—the last third of the Mesozoic Era (in the Phanerozoic Eon, if you must know). It was named in 1842 by the great paleontologist Alcide d'Orbigny for the Touraine region of France, but Colorado has a more complete set of Turonian rocks. The newly marked Turonian GSSP is in a railroad cut north of Pueblo Reservoir at 38.2822°N, 104.7275°W, specifically at the base of Bed 86 of the Bridge Creek Member of the Greenhorn Limestone. A 12-page paper in the stratigraphic journal Episodes describes it in excruciating detail. 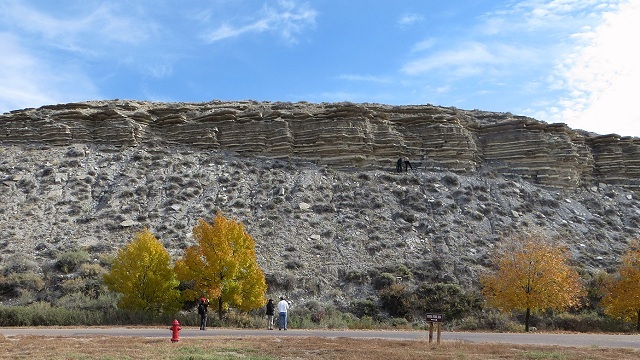 A metal marker and explanatory signage were dedicated on October 25 by a crowd of geologists who were in the area for the annual meeting of the Geological Society of America's annual meeting in Denver. It ought to last for a good long while. But even if it disappears, the published description is the true boundary and the marker is merely a convenience. The United States has six other GSSPs. Three are in the Guadalupe Mountains of Texas, marking the Roadian, Wordian and Capitanian ages of the Guadalupian Epoch in the Permian Period. One in Arrow Canyon, Nevada, marks the Bashkirian Age in the Early Pennsylvanian Epoch of the Carboniferous Period. 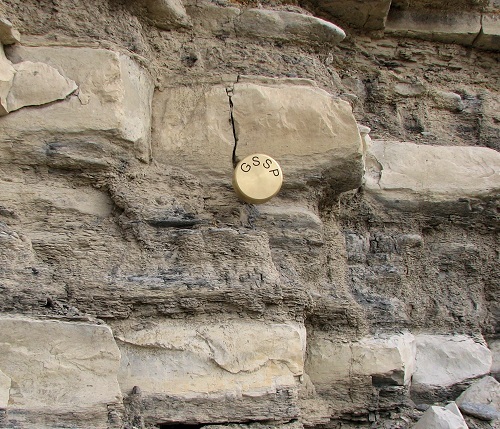 One near Atoka, Oklahoma, marks the Katian Age of the Late Ordovician Epoch. And one on Drum Mountain, Utah, marks the Drumian Age, part of the Cambrian Period. Collect them all!